The fabulous Blu-ray Ripper for Mac enables you to convert Blu-ray discs, DVD movies and general videos to the other video formats that you want most. And before conversion, you are able to edit the output video with versatile editing functions. 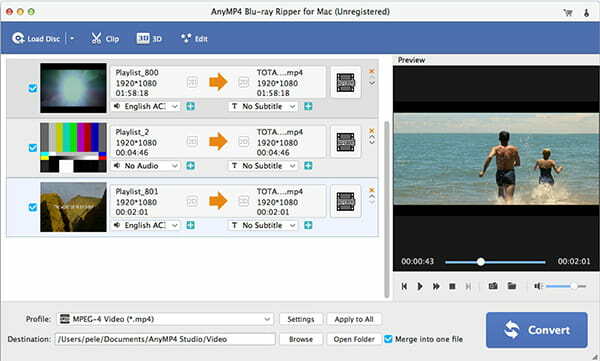 4Videosoft Blu-ray ripper for Mac an expert in converting Blu-ray discs and DVD movies to popular MP4, MOV, M4V, AVI, FLV, etc videos. And it enables you to convert general videos to other popular videos you need. The powerful Blu-ray Ripper for Mac provides you with powerful editing functions like trim, crop, watermark and effect and so on. 4Videosoft Blu-ray Ripper for Mac enables you to convert Blu-ray discs and DVD movies to ordinary video formats. You can set the output video to MP4, MOV, M4V, WMV, AVI, FLV and more. 4Videosoft Blu-ray Ripper for Mac is also a professional video converter program, which is able to help you convert ordinary videos to other videos. So with it you can enjoy these output video on your portable devices like Samsung Galaxy S4, BlackBerry, iPhone 5, iPhone 4S, iPad 4, iPod touch and so on. To get a better performance of video, you are allowed to edit your output video by the personalized editing functions. It lets you modify video by adjusting brightness, contrast, saturation, hue and volume. You are able to reset the video length and screen size by the trim and crop function. And you are allowed to merge several videos into one. What’s more, you are able to add your favorite text and image watermark for your output video. You are enabled to preview the source video and take snapshot with the Blu-ray Ripper for Mac. It gives you accelerate experience with the help of NVIDIA and AMD tech. Enhance your videos with an echo effect for free! Echo FX Lite enables Adobe After Effect to add video echo to your clips. Three custom parameters control how the echoes look. Echo FX Lite can produce stunning video clips out of ordinary recordings. Aiseesoft MKV Converter is a best MKV Video Converter, which can help you convert MKV video and any other video/audio files to all popular video and audio formats with super fast conversion speed.